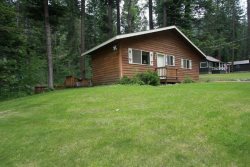 This beautiful cabin is located in the back corner of the Wallowa Lake Resort property, making it quiet and private. The wood floors and accents provide a warm cozy feeling. You can snuggle up on the leather couches with a book in front of the warm fire or just hang out with the family! It is a great place to watch deer from the large, covered deck. This cabin also includes a propane barbecue in which you can have a picnic at the picnic tables below the cabin. This Wallowa Lake cabin has an open floor plan with one large room which combines a kitchen and living room. Off of the great room are two bedrooms and two bathrooms. It is close to the lake and walking distance to most of the Wallowa Lake activities, including the Wallowa Lake Tram.